1. 3 oranges, cut into wedges, do not peel. 2. 3 pounds(lbs) apples, cored, cut into wedges, do not peel. 3. 2 pounds(lbs) fresh cranberries, raw. 4. 1 1/2 pound sugar. 5. 25 leaves, leaf lettuce. 6. 3 heads iceberg lettuce, shredded. 1. 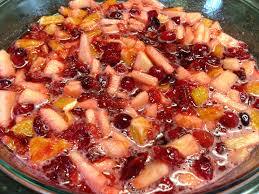 Grind the apples, oranges and cranberries through the food grinder, using the coarse chopper plate. Mix together thoroughly. 3. Line each cold salad plate with a leaf of lettuce. Sprinkle on the shredded iceberg lettuce. 4. Drain the juice off the salad and place a mound in the center of each salad plate. 5. Top with a small amount of salad dressing, garnish with a sprig of parsley. 1. 25 large peach halves canned, cut in half. 2. 3 pounds(lbs) cottage cheese. 3. 25 red maraschino cherries with stem. 5. 3 heads iceberg lettuce, shredded. 2. Place a scoop of cottage cheese in the center of each salad plate. 3. 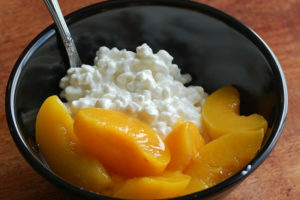 On each side of the cottage cheese place a wedge of peach. 4. Place a maraschino cherry on top of the cottage cheese, garnish with a sprig of parsley.